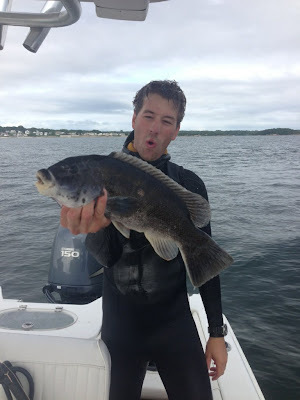 On Saturday afternoon, the shot that took this Tautog traveled another few feet and hit a second "Tog" before stopping. BFC alums Alex Hernandez and Nate Eichelberger witnessed the event while lambasting scup from the nearby boat. The scup were deployed for stripers but alas, the stripers were elusive. Dug this one up from waaay back. Notice the spear hole above left middle finger (not a kill shot). This fish turned into an amusement park ride before surrendering and making an excellent fish curry, and ceviche, and steaks.